Angel Maturino Reséndiz aka The Railroad Killer was an itinerant Mexican serial killer responsible for as many as 15 murders across the United States and Mexico during the 1990s. Some also involved sexual assault. He became known as "The Railroad Killer" as most of his crimes were committed near railroads where he had jumped off the trains he was using to travel about the country. On June 21, 1999, he briefly became the 457th fugitive listed by the FBI on its Ten Most Wanted Fugitives list before surrendering to the Texas authorities on July 13, when he was 39 years old. He was convicted of murder and was executed by lethal injection. 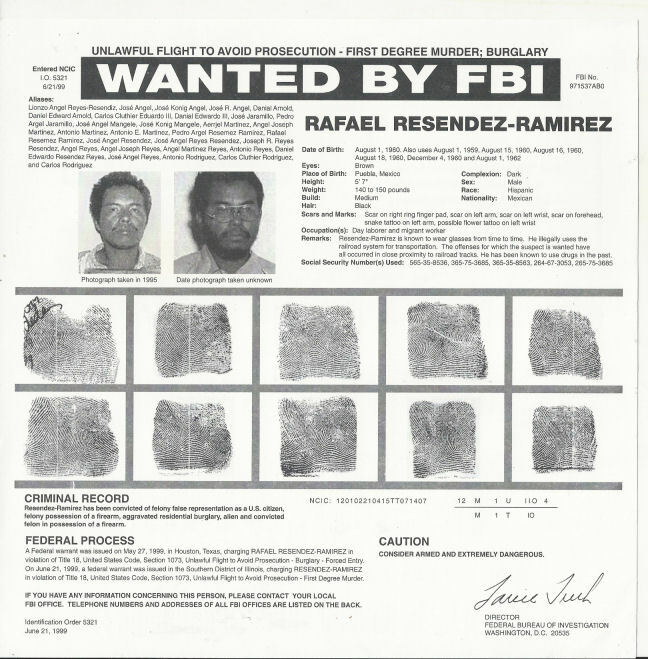 Reséndiz had many aliases but was chiefly known and sought after as Rafael Resendez-Ramirez. One of his aliases, Ángel Reyes Reséndiz, was very close to the name Ángel Leoncio Reyes Recendis given on his birth certificate from Izúcar de Matamoros, Puebla, Mexico. Reséndiz was in the United States illegally. Reséndiz was executed in the Huntsville Unit in Huntsville, Texas, on June 27, 2006, by lethal injection. Original (NOT A COPY) FBI wanted posted issued June 21, 1999. Measures 8" X 8". Scans show front and back. In excellent/mint condition.